Green-fingered residents of South Somerset still have time to sign up for doorstep garden waste collections this year and for the first time they can now subscribe online. With each pick-up working out at less than £2, over seven thousand households have already signed up, saving themselves the task of travelling or arranging private pick-ups to dispose of clippings, pruned branches and weeds. From this week, a new online facility will allow people to sign up or renew subscriptions within seconds by clicking "Apply For It" at www.southsomerset.gov.uk. The service, which is available for the annual fee of £42.50 to every household in the district, includes twenty-five fortnightly collections from April 2011 to March 2012. 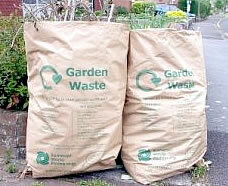 Households that produce less green waste also have the option of buying bundles of garden waste sacks at £25 for ten sacks, including delivery. "From the outset this service has been providing a convenient alternative to driving to and from recycling centres throughout the year. It is also better for the environment in terms of swapping hundreds of cars to a few collection vehicles each time," said Vega Sturgess, Operations and Customer Focus Director at South Somerset District Council. South Somerset District Council expanded the service so that it covered even the most rural areas of the district in October 2009, in response to popular demand. Subscriptions can also be made by calling 01935 461060. Payments can be made by debit card, cheque or credit card, or in cash when handed in at the District Council Petters Way offices in Yeovil or Holyrood Lace Mill offices in Chard.